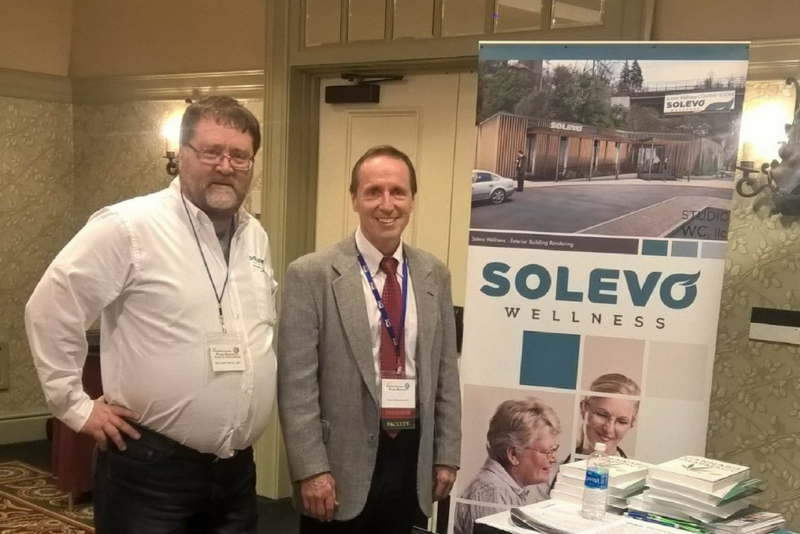 Solevo Wellness recently attended the 2nd annual meeting of The Pennsylvania Pain Society held in Hershey, PA from December 8 – 10. The conference was designed to provide a forum for healthcare professionals to discuss evidence-based treatments and techniques in pain management. Medical Marijuana was a major topic at the conference, with 6 hours of breakout sessions dedicated to the subject. Solevo Wellness was represented by Dr. William Fritz and by Chief Operating Officer Samuel Britz. Dr. Fritz is shown above, along with Dr. Bruce Nicholson, President of the PA Pain Society. Over half of the 244 medical professionals in attendance visited the Solevo Wellness booth. The Solevo Wellness team was pleased to be able to give out copies of Michael Backes’s book, Cannabis Pharmacy to 120 of the booth visitors. These are encouraging signs at a time when the Department of Health has named opioid abuse the most critical health issue facing Pennsylvania. You can read more about medical marijuana and opioids on our site. Medical marijuana can be a safer method of providing relief for qualified patients and Solevo Wellness is proud to be at the leading edge of the movement. Are you looking for more information on PA medical marijuana? You always get in touch with us and sign up for our email newsletter on our homepage. We’d be happy to answer any questions you or a loved one might have.